Owner, operator, and Webmaster of PhotoGuide Japan (photojpn.org) and PHOTOGUIDE.JP. Hakata-ku, Fukuoka) closed on Aug. 27, 2002. This is the second major photo gallery in Fukuoka to close this year. The other one was Minolta Photo Space Fukuoka which closed at the end of March. I wrote a full-length article about attending a two-year vocational photo school called shashin senmon gakko in Tokyo. Good article if you wonder what it’s like to attend a photo school in Japan. 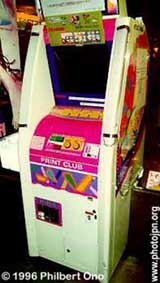 Print Club, nicknamed “Puri-Kura” in Japanese, is a small photo booth found at video game arcades in Japan. The Print Club machines produce these small photo stickers (about 2.5 x 2 cm, slightly smaller than a postage stamp) which feature a large variety of superimposed frames which compliment the subject’s faces. I wrote a full-length article about it here. If you are in or near these cities and need your Nikon camera to be repaired, you will have to send it to the Tokyo repair center. For more info, call Customer Service: 0570-028000. I read in a Japanese camera magazine that 70% to 80% of sports photographers who covered the World Cup in Korea and Japan used a digital SLR camera and laptop computer to beam their soccer pictures back to their headquarters. This is a huge leap from four years ago during the 1998 Nagano Olympics when only a small minority of sports photographers used a digital camera. How quickly things can change. In professional sports photography, the transition to digital is nearly complete thanks to the advent of better, faster, and cheaper high-end digital SLRs. You may wonder which digital camera they were using. It usually was either the Nikon D1x or the Canon EOS-1D. Canon actually was the camera of choice among sports photographers in Japan who used film. (You might have noticed more white EOS telephoto lenses than black Nikkors at major sporting events). But now in the digital SLR age, Nikon has made major inroads in this market with the introduction of the pro-use D1 about two years before Canon unveiled the 1D. Right now, it looks like a 50-50 split between the two rival manufacturers in the sports photography market. Japan’s largest museum dedicated to photography recently revamped their Web site. It now looks slick and professional, but they got no English version. They used to have an English version, but not anymore. I hope they are working on the English version. Update: The URL has changed yet again. This month’s July 2002 issue of Asahi Camera magazine is their annual special issue on nudes. The pictorials feature nudes by a number of photographers. My favorite were the underwater nudes by marine photographer Ikuo Nakamura who usually photographs fishes instead. He had two young Japanese women swimming underwater in sunny Saipan. The rippling shadows from the ocean surface covered their white bodies in the bright blue water. Very nice..
Up until a few months ago, famous woman photographer Hiromix had her own official Web site at hiromix.net, but it has suddenly disappeared. I have no idea why she took it offline. It didn’t have much. Just an announcements page, a biography page, a message board in Japanese, and her online diary, but no photos. She also had a links page which included a link to my book reviews of her photo books. That was nice. I hope she comes back online. Wasn’t the World Cup unbelievable? I was never interested in soccer until Nippon’s first World Cup match in Japan. Throughout June, I was more fascinated by the reaction and high emotions of soccer fans rather than the game and matches themselves. In Osaka, hundreds of people jumped into the murky river at Dotonbori to celebrate. I wish we had a tradition like that here in Tokyo. But I could never stop thinking about the potential benefits of having a message board (also called BBS or forum). It would make some things convenient, such as exhibition and event notices submitted directly by users. An online community might also develop. I’m not too confident about seeing an active online community develop because Japanese photography is not exactly a hot topic except for camera owners seeking support and people outside Japan wanting to know camera prices in Japan. So all I can do is give it a shot and see how it goes. I was very fortunate to have a friend tell me about this terrific message board software called phpbb. It’s so good (and secure) that it makes it fun to operate a message board. Out of all the great features it has, I like the multilingual support the best. This is really important for bilingual people like me. Registered users can set the message board’s user interface to any of the major languages of the world including Japanese. You can type Japanese anywhere on this message board. And since this message board is hosted by PhotoGuide Japan instead of a third party (like Yahoo Groups), we have complete control over everything. Right now there are 10 or so different message boards under PhotoBBS. I can add more at anytime. If there is a demand, I can even create a private (or public) message board for special interest groups. It could be area-based (such as for photographers in Hokkaido, Osaka, Kyushu, etc. ), subject-based (such as Japanese vintage photography), or occupation-based (postcard collectors, women photographers in Japan, etc.). So if you know a bunch of like-minded friends looking for a good (and free) message board to join, consider PhotoGuide Japan’s PhotoBBS. The possibilities and potential benefits are too many to ignore. So finally, our first message board system. Hope you like it and use it! Update: PhotoBBS was shut down and replaced by PhotoGuide Japan News in July 2010.